An expected price increase of gasoline by Mongolian distributors presents new challenges for the coalition government and worries for the public and businesses. As informed by Mongolian fuel importers, Rosneft, the largest Russian oil company, has begun to charge extra for the popular gasoline brand AI-92 as well as for diesel because of recent structural changes and production expansion costs from November 1, 2012 (MONTSAME, November 5). Any slight change in the gasoline retail price often leads to price increases in Mongolia for other goods and services, as well as panic buying due to fuel shortage fears. In the absence of natural gas and inadequate electricity grids, many rural communities are still dependent on diesel power generators. In addition, the country is experiencing increased consumption of fuel in the mining sector, agriculture, freight forwarding companies as well as due to the growing number of vehicle owners. To avoid potential market panic, Prime Minister Norovyn Altankhuyag has engaged in discussions with the key Mongolian distributors, encouraging them not to increase the retail price. Whereas, the Authority for Fair Competition and Consumer Protection has criticized the distributors for suggesting unreasonable price increases (MONTSAME, November 5; NewsMN, November 2). Although the government has promised several financial incentives to fuel distributors, these are only short-term solutions and may even become hostage to domestic politics around the upcoming local elections in November as well as the presidential election in 2013. As usual, following the anticipated fuel crisis, officials and the public have discussed diversifying fuel suppliers, constructing facilities to refine its limited oil reserves or to liquefy coal sources, and increasing the country’s oil reserves. Since 1990, all succeeding governments have sought ways to diversify sources in order to maintain a stable fuel supply, but options are limited. By the fate of its geography, Mongolia has only two possible options to import fuel: either from China or Russia. Because China is also an importer, the only option for large, stable gasoline imports comes from Russia. Mongolia has been dependent on Russian state-owned Rosneft Company for over 90 percent of its total fuel imports. But Russia has often responded to Mongolia’s request for a reliable, stable gasoline with frequent price increases at critical seasons for the country’s mining and agricultural economy—according to Mongolian politicians and fuel importers. Sometimes, high-level meetings between Ulaanbaatar and Moscow appear to be dominated by the Russian state-run oil company. For instance reportedly, the main success of President Tsakhiagiin Elbegdorj’s trip to Moscow last year was the assurance of the Kremlin to maintain the fuel supply to Mongolia (NewsMN, June 7, 2011). 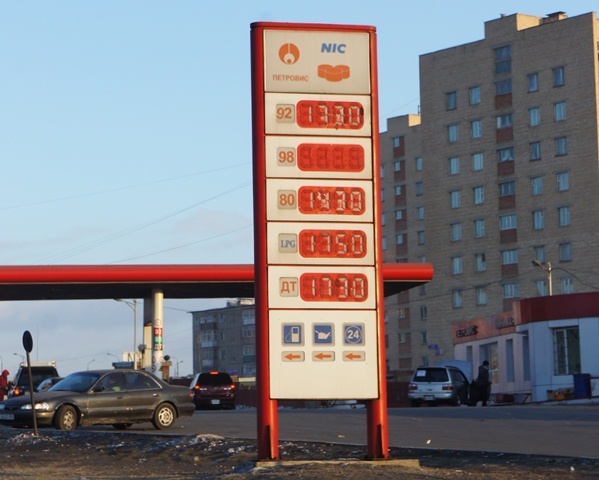 Similarly, Rosneft’s proposal of establishing 100 gas stations in Mongolia was also perceived in Ulaanbaatar as Russian economic pressure (Udriin Sonin, November 14, 2011). On the one hand, Rosneft’s proposal could be understood as the Russian oil company’s effort to increase its exports to Mongolia. But, on the other hand, the proposal triggered sudden protectionist debates among Mongolian politicians, fuel distributors and the public. According to Russian Ambassador to Mongolia Victor Samoilenko’s explanation, price changes and shortages in the fuel supply need to be explained in the context of the international market, policies of Mongolian fuel distributors and the increasing fuel consumption in Mongolia (Udriin Sonin, May 15). Mongolia’s fuel usage jumped from 30–35 tons per year, to 85 tons in 2011. And the number of heavy trucks in the Mongolian fleet used to export coal to the Chinese market reached 5,000 (Undesnii Medee, May 16). Despite these reasonable explanations, Mongolia—as a small country situated between two larger neighbors—still tends to perceive fuel price fluctuations through geopolitical and geo-economic lenses. Since the collapse of the Soviet Union, Mongolia has viewed Russia as a reliable, strategic partner. Although Ulaanbaatar made numerous efforts to revive its bilateral relations with Moscow, particularly in trade, to counterbalance the fast-growing economic relations with Beijing, Russia was unable to pay significant attention to Mongolia’s request due to its own political and socio-economic challenges. In addition, despite its “third neighbor” policy of building ties with developed democracies, Mongolian foreign policy priorities have always concentrated on its neighbors, particularly on Russia (Foreign Policy Concept of Mongolia, 1994). Russia’s response to Mongolia’s diplomatic overtures developed slowly, but was eventually revived with President Vladimir Putin’s visit to Ulaanbaatar in 2000 (kremlin.ru, November 13–14, 2000). Moscow’s economic and geopolitical interests were expressed more clearly during President Dmitry Medvedev’s visit in 2009 on the occasion of the 70th anniversary of the Soviet-Mongolian victory over Japan’s Kwantung Army in the battle of Khalkhin Gol (Xinhua, August 27, 2009). During the visit, both sides agreed to develop their strategic partnership with an explicit focus on economic cooperation—in the areas of mining and infrastructure development. Russia agreed to invest in extraction of uranium, extension of Mongolian domestic railroad networks, and joint mining ventures (Strategic Partnership Declaration, 2009). Even though Mongolia’s fuel imports have constituted the majority of the bilateral trade from 1990, they were not mentioned in the declaration. In addition to fuel leverage, Russia still maintains several important business stakes in Mongolia. The Erdenet copper mine, which produces 40 percent of Mongolia’s gross domestic product (GDP), is equally owned by Russia. Also, the state-owned joint mining concern, Mongolrostsevetment, and the trans-Mongolian railroad are also jointly run by Russia. These joint ventures also provide significant economic leverage in Mongolian politics. For instance, Russia successfully discouraged Mongolia’s efforts to receive $188 million of assistance from the US Millennium Challenge Account to renovate its railroads and to build a second trans-Mongolian link with Chinese developmental assistance (The Mongol Messenger, 2009). Also, Russia wholeheartedly supported Mongolia’s decision to expand its domestic railroad links using the Russian standard gauge rather than linking key mining sites in the Gobi area directly to China’s rail network. During their subsequent visits to Mongolia in 2009, President Medvedev and Prime Minister Putin agreed to provide $250 million for a railroad modernization project and 1,000 cargo train cars (Government Press, May 13, 2009). From the fuel supply to joint ventures, Russia remains a visible factor in Mongolian politics and its economy. However, Rosneft’s monopolistic policy over Mongolia’s fuel market has begun to intensify Mongolia’s efforts to find alternative fuel suppliers, such as Kazakhstan and the Gulf states, as well as to refine its crude oil rather than exporting to China. But for the time being, Mongolia’s burgeoning economy will remain vulnerable to imports of Russian gasoline.